If you combine patience and perseverance, you get an unstoppable force. And an unstoppable force gets results. Meet Khadijah Shabazz. Soon, she and her daughter Sakile, 22, who has cerebral palsy, will move into their new home on Carver School Road in Winston-Salem. It’s a milestone they’ve reached by keeping their eyes on the prize of home ownership through Habitat for Humanity. On Thursday, June 14, the Shabazz family was surrounded by Habitat officials, friends, and State Employees Credit Union officers for their home’s dedication. The house is part of the SECU Foundation’s $10 million Mountains-to-the-Sea Challenge, to build a Habitat home in each of North Carolina’s 100 counties. 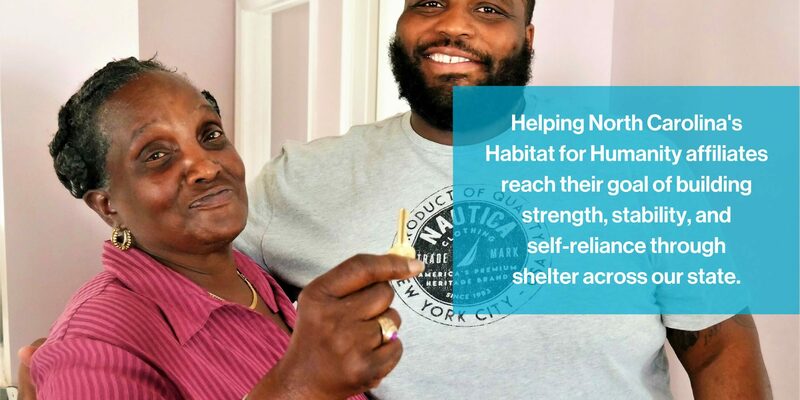 Once the homeowner assumes a zero-percent-interest mortgage, the SECU Foundation returns the funds to the habitat affiliate so that another home can be built. Khadijah Shabazz, left, and Mike Campbell, executive director of Habitat for Humanity of Forsyth County, lead the dedication of a new home in Winston-Salem for Shabazz and her daughter Sakile. Fentress Gerald of the State Employees Credit Union, right, presents Khadijah Shabazz with the keys to her new home. Fentress Gerald of the local branch of the SECU, standing in front of the house with a team from her office, spoke next. “We are committed to supporting Habitat’s mission through the generosity of SECU members who donate their $1 a month maintenance fee to fund the SECU Foundation,” Gerald said. She presented Shabazz with the keys to her new home. A rousing cheer went up from the crowd. “I thank each and every one of you,” Shabazz told the crowd. “I remember riding by when this was a vacant lot. Now look what God did. Khadijah Shabazz, left, with Fentress Gerald of the State Employees Credit Union. Fentress Gerald, right, of the State Employees Credit Union, leads the cheers as Khadijah Shabazz cuts the ribbon at her new home on Carver School Road in Winston-Salem. The three-bedroom home has two baths, one of which is designed to accommodate a wheelchair. Doors are designed to allow easy access via a wheelchair. It also has a firm foundation upon which Khadijah and Sakile will build the rest of their lives.